Once again President Obama is doing the right thing. This time he’s sticking it to Prime Minister Gordon Brown, the lame-duck leader of the once mighty, now disgraced British Labour Party. Obama within the past few days has turned down no less than five requests from Brown and his minions to have a meeting together at the UN or at the G20 summit. While in New York Obama had bi-lateral meetings with Russian president Medvedev, Chinese president Hu Jintao, and Japanese prime minister Hatoyama, but not riff-raff like Brown. Obama obviously has his standards. Obama is still pissed at the Brown-Gaddafi Faustian deal to have the Lockerbie bomber Abdelbaset al-Megrahi released from prison and shipped back home to Libya so that BP could fatten its profits with the proceeds of a gazillion barrels of Libyan oil. For Brown, the only ethical lapse of this sorry deal was that his pal Gaddafi promised a low-key homecoming for Al-Megrahi and didn’t deliver. Instead the Colonel gave the convicted murderer of 270 innocent victims a hero’s welcome. 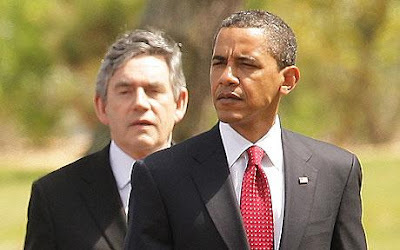 Unlike Brown and his oily and unctuous predecessor Tony Blair - now taking up space as the most useless special Middle East peacemaker in history - Obama has principles. Not only is Obama ignoring him, the hapless Brown was even outmuscled for a prime time speech slot at the UN by his pal Gaddafi whose 100-minute wacko speech left hardly any time at all for Brown’s snore fest about climate change. But Brown has even bigger problems than being snubbed and ignored by Obama or bulldozed and elbowed out of the way by his pal Gaddafi. The lastest of a very long list of beefs from within his party and caucus is that he is now under fire for refusing to fire his Attorney General who was convicted of employing an illegal immigrant. Backbenchers, ex-ministers, and party regulars are demanding that he put the party and the country out of their misery by leaving office now, while the party still may have a chance to avoid a cataclysmic defeat in the next election expected in 2010. This could be the beginning of the end to the once mighty Labourites. If so, because of Brown and Blair there will be few tears should it come to pass.